I’m a cyclist but I’m also a pedestrian, driver and passenger (car, bus, plane, train, ferry) but I don’t define myself by any of these modes of transportation in particular as there is something that combines them all – I’m a human being. There is a problem however in that some cyclists and drivers seem to have forgotten that the people they are sharing the space with are in fact other human beings and instead see them as bloody cyclists or bloody van drivers etc. As we are all human beings we are all connected, the person driving that van might be driving important medical supplies to a hospital where the cyclist is the surgeon about to use those supplies in a life saving operation for the daughter of the lady in the mini who has got up a bit too late and has not had time to do her make up so is putting it on at the lights. If via our interactions we could see each other as human beings I’m convinced that the world (and the roads I ride on in particular) would be a safer place. You see I’m not a cyclist, I’m a son, father, brother, lover – I’m all of these things and so are you and all of us. If I could ask for one thing as I ride it would be that, simply to be seen as a human being. When I ride my bikes I’m doing one of two things – getting from A to B for some reason (usually to or from work) or having some fun – sometimes I even have fun riding from A to B, but at no time am I trying to inconvenience or cause anyone else a problem. A couple of weeks ago on my way into work the cyclist in front of me ended up under a car that hadn’t seen him. I don’t know if he survived but I fear that he didn’t. He was going to work but will probably never get that opportunity again. How will his family feel and how will that driver wailing by the side of the road ever recover? All sorts of hopes and fears flashed through my head as I struggled to hold back my own tears while cycling on to work. We are humans we are all connected. These thoughts and others occurred to me again when I went to see the Bicyclism exhibition at Leeds Museum which celebrates the human side of cycling. Yes some people put lycra on to ride their bikes, they are still human beings, other people of all ages, colours, shapes and sizes ride all sorts of bikes for all sorts of reasons. 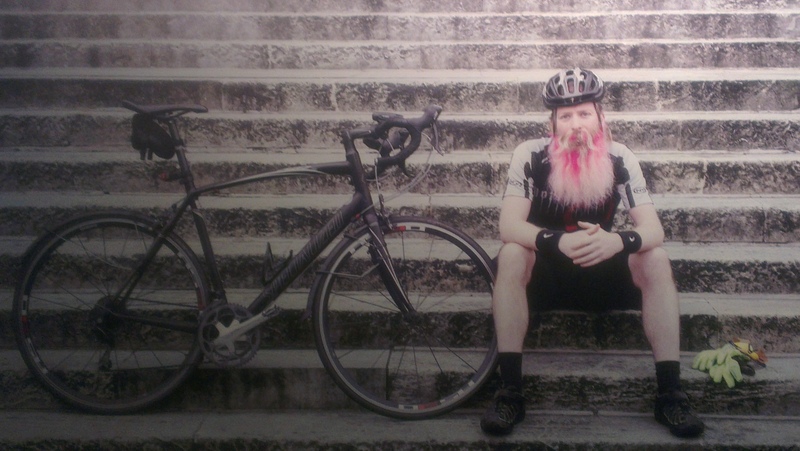 The exhibition celebrates this with a mixture of portraits of Leeds people and their bikes taken by Casey Orr together with a collection of self portraits of Leeds people and there bikes across the ages that you can also view via the online gallery. The exhibition is also supported by a lovely Bicyclism newspaper featuring pictures, quotes and a lovely essay on bikes and cycling by Boff Whalley. Good article made.me think about the person beyond the lycra and avoiding making assumptions. Yes, I, too, really enjoyed this post. Often, when I’m cycling through Neath, a very small town on my commute, I get the feeling or vibe, if you like, that other road users, particularly bus and taxi drivers, have the impression that I am only cycling to annoy them. This is sometimes confirmed by their bad, impatient driving, gestures and verbal abuse? A lot of other road users feel like this toward cyclists, but maintain their discipline. I believe there is a link between this attitude, and the drivers who are earn their living on the road. It is a very negative link. Van, bus, lorry and taxi drivers need special instruction on sharing the roads with a vastly expanding cycling population.